A rail with a low-friction roller system allows you to perform reverse crunches that activate the back, arms, hips and legs in addition to the abdominal muscles. Durable foam pads are padded to increase comfort during workouts. Pull yourself upward with the help of the rolling mechanism while resting on the knees. With a strong metal security pin, the slide may be tilted to choose between different resistance levels of different angles from easy to difficult, gradually increasing the intensity of your workout sessions. Built-in LCD display keeps track of your workout by showing you the calories burned, time , distance and count. It can be reset at any time. Designed for easy transport with the foldable frame, this abdominal trainer can be easily and compactly stored anywhere in your house, such as in the closet, under the bed or in a convenient corner. 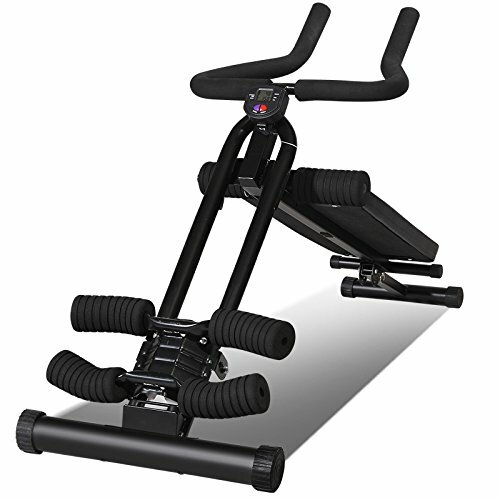 2 in 1 Design: Combined AB cruncher and AB bench, offers multi ways to do home workout gym. Heavy-duty steel frame construction with antirust paints, and foam rollers hold your lower legs in place for hyperextension exercises and your feet in place for crunches. Choose between different resistance levels of different angles from easy to difficult mode, gradually increasing the intensity of your workout sessions.